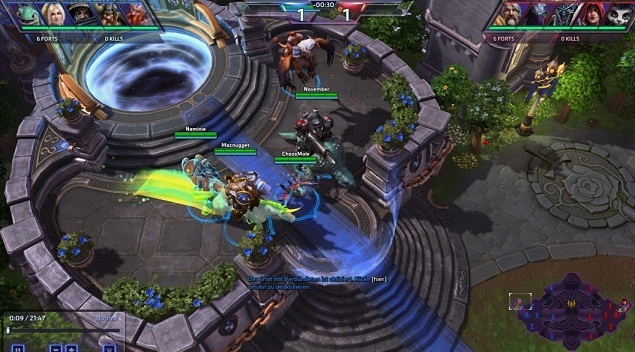 With Heroes of the Storm Blizzard wants to bring those into the genre. With games like Dota 2, League of Legends can not do anything, because there the barriers to entry are too high but for Heroes of the Storm should know a few basics before taking action. We have compiled the most important for you in this beginner's guide. The term MOBA now every skin around, often without knowing what does that mean. Multiplayer Online Battle Arena namely - a game so, in the team in a limited area compete against each other. The term is derived from Guinsoo, one of the developers of the Warcraft 3 mod Defense of the Ancients, also known as DotA. The most successful representatives of the MOBA genre is now League of Legends, which has already been facilitated by some elements of the original concept. Dota 2, however, is similar to the rules Original forth like peas in a pod and is therefore considered in addition to Heroes of Newerth as most complex MOBA game. In third place now ranks SMIT , MOBA a hybrid shooter game. Although Blizzard now be Heroes of the Storm called 'Arena Brawler', it is the core but a MOBA game and in all probability this term will continue to hold. Because: As in any other game of this genre, you control in Heroes of the Storm predominantly a single character in an environment as they like from real-time strategy games (RTS) Command & Conquer or Warcraft 1-3 knows. But unlike in the RTS genre their own base in the MOBA-games is already fully equipped and sends in troops periodically over several predefined paths, so-called 'Lanes', towards the enemy positions. The aim of the game is now to strengthen these forces with his team-mates such that the opponent's main building falls. Needless to say that the opposing team has exactly the same goal and the same time would like to stop our advance. In order to slow down the advance of the armies something the developers have put defensive towers in the way. The attack the enemy troops and players and do not share a rare regular damage from. However, beyond the 'Lanes', there are paths - the so-called jungle. There are various critters different strengths in their 'camps'. Dying these creatures fall, as well as with the opposing forces on the 'Lane' or the enemy hero, one serving from experience. This experience growth causes the hero to rise in level, stronger and possibly get new active or passive properties - 'Skills' called. A MOBA so is therefore a mixture of RTS and RPG - similar to the heroes elements from Warcraft 3, of which the concept has not been recently adopted in DotA. Acquired in the match level are not taken in the next round - the battlefield is then completely reset and all the heroes start over again. Between the matches every genre representatives offering different options. Some one has to unlock new heroes, others offer a complete range of heroes from the beginning. In addition, there are 'Skins' managed, however, all of which will purely cosmetic tasks, so do not affect the strength of the hero in the game. So much for the principles of MOBA games in general. After probably much deliberation it was decided at Blizzard to maintain above-mentioned principles and to screw on a few details, to emphasize above all elements that are needed even in other games of this genre. The most decisive difference in this regard: In other MOBA games you buy during the match items and weapons from the earned gold. In Heroes of the Storm, however, there is no gold, and consequently nothing that could be for sale. Instead, Blizzard brings talent into play, from which to choose from and to the ascent of. In particular, the 'Ultimate' is important to get the heroes with Level 10. This skill is characterized by a high decay time and the fact that he may have a particularly strong influence on the gameplay and team battles - whether through damage by healing or in one way or another wacky way. The highlight in Heroes of the Storm: Once you have played the appropriate hero often enough, some additional talents and a second 'Ultimate' as alternatives to choose from. Blizzard would thus give the player the opportunity to get used to the heroes before him confused with too many options. In the Community, this procedure is controversial because some players essential ways of heroes deprived and thus see at a disadvantage. While Dota 2 and LoL will be played mainly on a single card, Blizzard will provide a bit more variety and has accordingly the same thought several battlefields, of which to each match one is chosen at random. These cards all follow the same laws of nature, have the Lanes, the marching troops and the creatures in the forest. Neutrality was yesterday - today is fighting the forest for us! The latter can not be killed in Heroes of the Storm - they only defeated and get them to automatically join the troops on the 'Lane'. An essential element in Heroes of the Storm, because you so can ensure that the advance of their own troops picks up speed, the 'Lanes push' while engaged the enemy heroes themselves. Besides the neutral troops there in the jungle yet 'events' that are different from card to card. The team usually has to kill, collect or deliver to trigger an action that can contribute decisively to win something. Where exactly these events will take place mostly on the mini map, the small map at the bottom of the screen display. What events there is concrete and how they work, we explain later in a separate guide. Eyes, which helps in seeing! Speaking minimap. This feature also comes from the genre of real time strategy games and is essential for a successful MOBA player. On the mini map can be followed in a compressed form, what happens on the entire battlefield - unless it is the fog of war, covered by the 'fog of war'. Good players take the mini important information which often remain closed beginners. This often leads to the fact that professionals of the Map-hacking accused because they retire just at the moment in which you want them attacked from ambush. Indeed, there is usually for a natural explanation, because a professional often draws also from the things that he just does not see on the mini map, the right conclusions. In addition, it is also generally not very healthy in Heroes of the Storm, to be alone for too long on the road. Not only you are safe in the team and, in case of enemy contact the full potential of the group, you can also rotate more times a neutral camps and prevent the opponents from completing the event. Also: While in other MOBA games has its own pool and Experience alone can potentially level up faster and collect money the team in Heroes of the Storm has a shared pool of XP. The entire team will rise to the same time, which can change the entire game play especially when reaching level 10 and thus the activation of all Ultimate Skills. Before embarking on a team fight, so you should necessarily have its own the XP bar of enemies and in the eye. "Do not Steal My creeps!" Also an item that Blizzard has not been included in Heroes of the Storm. While it is important in other MOBA games, perform the final blow to a dying creature to collect more gold and experience you have to stand in Heroes of the Storm just nearby. This also applies to those passive skills in HOTS that build up in accordance with the slain creatures. Being there is everything. Oh - and the Assassination own creatures or towers to escape the opponents gold and experience, at Blizzard's version is not possible. New here are for mounts that function similarly in a MMORPG. Anyone who takes damage from sitting. If you think you have in the base, can also teleport to regenerate the center. For smaller portions of health and mana, are here and there - almost 3 like in Warcraft All you should use them carefully and pay attention to the hit points, because depending on the level has players expose up to 30 seconds and missed so maybe his big use in Team Battle. So much for the basics of Heroes of the Storm. You can soon read in our next Guides more about the heroes and their roles on the maps and their events and important tricks for advanced users and professionals. Until then - good luck and have fun!